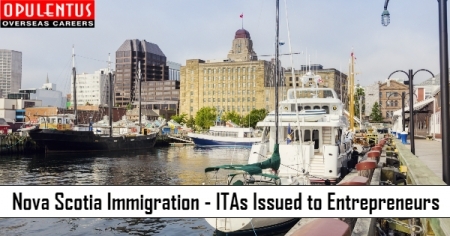 The immigration officials of Nova Scotia conducted fresh draws under the Entrepreneur and Graduate Entrepreneur streams on May 21st, 2018. In the Entrepreneur draw 18 candidates received Invitations to Apply for Nova Scotia Immigration and the candidate with the least-rank had a score 123 points. In the previous draw, held on March 27th 2018, 22 candidates received Invitations to Apply and the candidate with the least-rank had a score 108. Generally the highest number of invitations issued in a monthly draw is 36, and the lowest score is 90. The Nova Scotia Entrepreneur stream attracts candidates who have experience in senior management or business ownership. They must opt to reside in Nova Scotia; and must start a new business or take charge of an existing business. Besides they must also participate actively in the daily management of the business. In the Entrepreneur stream, the candidates first get a temporary work permit prior to applying for canadian PR after running the business for 12 months. There is an Expression of Interest format in the stream where candidates in a pool get the invitation to apply. Having an age of 21 years or older. Intention to live permanently in Nova Scotia at the time of owning and managing a Nova Scotia business actively. Having a Minimum net worth of $600,000. Investing a Minimum of $150,000 for establishing or purchasing a business in Nova Scotia. Having a Minimum experience of 3 years in actively managing/owning a business (33 percent ownership norm) or having more than 5 years experience as a senior business manager. Scoring at least 5 on the CLB in listening, speaking, reading and writing in English/French. The province also conducted a draw exclusively for the International Graduate Entrepreneur stream on May 21st 2018. In This draw two candidates received Invitations to Apply, with a score of 60 points. It was the eighth draw in the stream, and 12 candidates received invitation to apply so far. The International Graduate Entrepreneur stream has a few similarities with the Entrepreneur stream. It aims to attract recent graduates who pursue studies from either the Nova Scotia University or the Nova Scotia Community College. The norm is starting or purchasing a business in Nova Scotia and operating it for one year on a Canada Post-Graduation Work Permit. Candidates also receive nomination for PR in case they have an aim for settling in the province. The stream works on the format of Expression of Interest and is similar to the Entrepreneur stream. Completing a degree/diploma including minimum two academic years of full-time, in-person study at Nova Scotia University or the Nova Scotia Community College. Scoring at least 7 on the CLB in listening, speaking, reading and writing in English/French.